Her former owners named her as they thought of her: Hobby. In late September, she arrived at Tallgrass Parrot Sanctuary in Kansas smelling like stale cigarettes and rotting garbage. And she had completely plucked out all the feathers she could reach. Rescuers renamed her Javi. "We have decided to change Hobby's name to Javi, (pronounced "Ha vee") since no living being should be someone's hobby," the sanctuary wrote on Facebook. 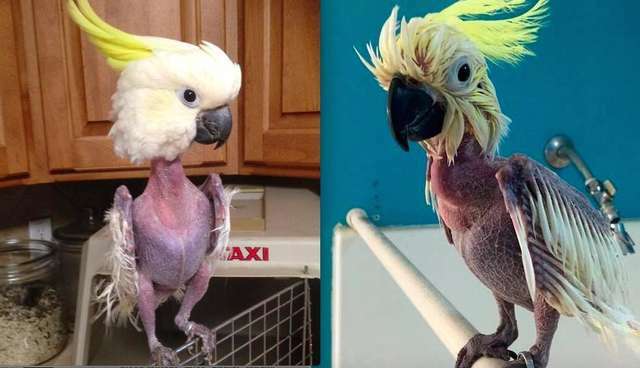 Birds like Javi respond to stressful situations and neglect by over-preening. When they aren't given enough sunlight, fresh air and love, they start to self-destruct. But kind people got to Javi just in time. They gave her a bath and fed her fresh fruit to make her feel more at home. Just a few weeks in, she started feeling more comfortable. "She is becoming more confident and loves to explore as long as I'm close by," a representative for the sanctuary wrote. And a recent video shows Javi is already settling into her new life. Only time will tell whether her feathers will grow back. Until then, the sanctuary plans to knit her some sweaters. Click here to learn how you can contribute to Javi's care.